Hacking is creative problem solving. A hackathon is an event where people come together to solve problems. Our goal is to do a one day event to learn how to tackle problems in daily IBM i programming and administration by integrating and using open source tools. - What about GDPR and security of the application? - What about performance tuning? - How to install the application? - Linking to the visited person with automatic SMS "the visitor has arrived"
The participants will take out their laptops and dive into these problems. Training will be provided for all participants. Think of the hackathon as training session to prepare participants for solving problems by thinking outside the box. At the end of the event, will do a wrap-up session and hopefully we will be able to demonstrate some accomplishments. Subject matter experts Mark Irish from Rochester IBM and Koen Decorte from Common Belgium will be present to assist and guide the event. They will work together with the participants. A successful hackathon is a combination of both hacking and training. Our goal is to make it as interactive as possible and have some fun along the way. Hope to see many of you at our event! The event is free for members of Common Be and Eu user group members or first timers dipping their toe in the water. Have an exclusivebehind the scene look of JORI, a Belgian company that creates perfect seating comfort. JORI has designed contemporary sofas, lounge & reclining chairs, chairs, tables and interior accessories since 1963. JORI stands for 100% Belgian craftsmanship. Find out howthis IBM Case study client and winner of the first Common Benelux Excellence Award has a full 3D configurator on IBM i. JORI fully relies on IBM i for all its operations. Did you know that JORI already had a website on IBM i in 1995? Discover the useof open source logon clients to replace active directory, linking of production machines, 3D R&D programs, CRM application using a web interface, use of iPads / iPods in production... Learn how you can implement some of these features at your company. This education richevent and New Year Reception is free for members or first event participants putting their toes to COMMON Belgium water. Fill in theevaluation form before dinner to receive a prize and qualify to win a free registration*to COMMON Europe Congress, 16-19 June, Berlin, Germany. 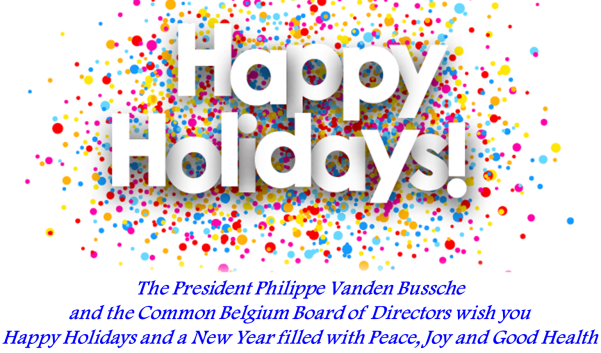 * Free CEC registration prize (€ 625) only for COMMON Belgium paid members of 2018 or 2019 by 28th February. • 17.00: Presentation on the IT infrastructure and IBM i use at JORI. 2019 will be yet another exciting year. Stay tuned! The Digital Transformation journey for IBM i focuses on educating attendees on how to align IT initiatives with key business objectives, how to lead their organizations into a digital era and why so many companies are focused on digital transformation. The event targets senior executives as well as developers and managers. It is a unique approach focused on educating all levels of the organization. Communicate you challenges, questions, pain points: fill the anonymous questionnaire here. are focused on digital transformation. This session will discuss the value derived from taking a solution-based approach to solving problems, as well as the key advantages of developing solutions that are based on real understanding of the people they are being built for. where and how Watson AI can be used in their organization. more productive. Please communicate them thru this anonymous questionnaire here.